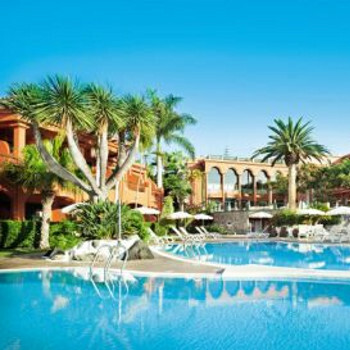 Small by Tenerife standards, this hotel is an oasis of tranquiliity - perfect for a relaxing holiday, particularly for adults. Rooms, pool,public areas,bars and dining rooms are maintained in a pristine condition. There is a wide variety of quality food available to suit all tastes and the staff in all areas are extreemly helpful and friendly. As with most Tenerife hotels, entertainment is at the best average. Much better to seek out the different types of entertaiment on offer at the varied establishments around the resort. The excellent location of the hotel means that beach, shops, bars, restaurants and public transport are just a short stroll away. We stayed at the Colon Guanahani in October 2006 and opted for half board. The hotel itself had an excellent position, rooms were large and roomy and kept immaculately clean but the biggest disappointment was the food. I'm vegetarian and found myself eating the same things every meal, bread cheese and salad! By the third day my husband who is not a fussy eater and not vegetarian was completely bored. We also felt the quality of food was well below what you would expect for 4*. We ended up eating out for the rest of our holiday and would not return to this hotel half board. The hotel is located near the beach in Playa Fanabe , very close to the restaurants and bistros near the ocean . It's very clean , the staff is more than polite , and you"ll have a great vacation if you choose it .